Since its recent introduction, the ZigBee protocol has created an enormous amount of buzz in venues from magazine covers to trade show floors to water coolers. Its promise of providing a simpler, cheaper, more power-efficient WPAN (Wireless Personal Area Network) alternative to WiFi and Bluetooth has opened up new data collection possibilities in application areas from industrial controls to medical devices to intruder alarms. Yet, despite this widespread interest, there is still little information available that goes beyond detailing the spec itself. Missing from the current ZigBee lexicon is practical, application-oriented guidance from an expert, specifically geared to aid engineers in implementing this new technology. Enter respected designer and popular columnist Fred Eady! 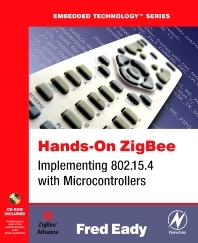 With his new book, Hands-On ZigBee, he provides the only comprehensive how-to ZigBee guide available. 7 easy-to-assemble ZigBee projects allow the reader to follow along...hands-on!